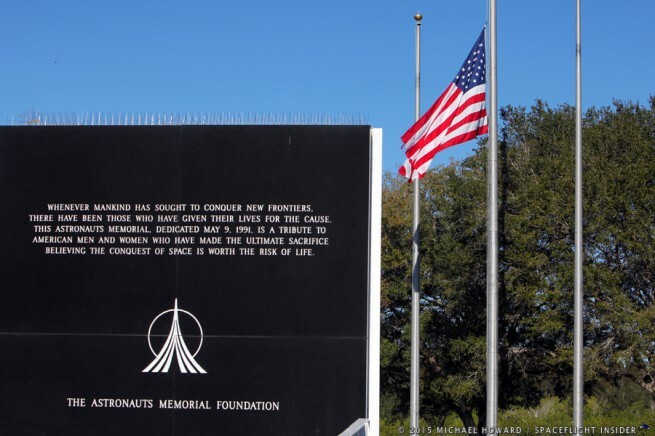 CAPE CANAVERAL, Fla. — Around 200 people gathered at the Astronaut Memorial at the Kennedy Space Center Visitor’s Complex at 10:30 a.m. (1330 GMT) on Jan. 28, 2015 to pay tribute to the crews of Apollo 1 and space shuttles Challenger and Columbia, as well as other NASA astronauts and ground support crew who lost their lives while furthering the cause of exploration and discovery. None of the family of the fallen astronauts were in attendance on the clear, sunny day which greeted the event. Before the ceremony, individuals approached the fence around the memorial and inserted carnations in the fence railing. 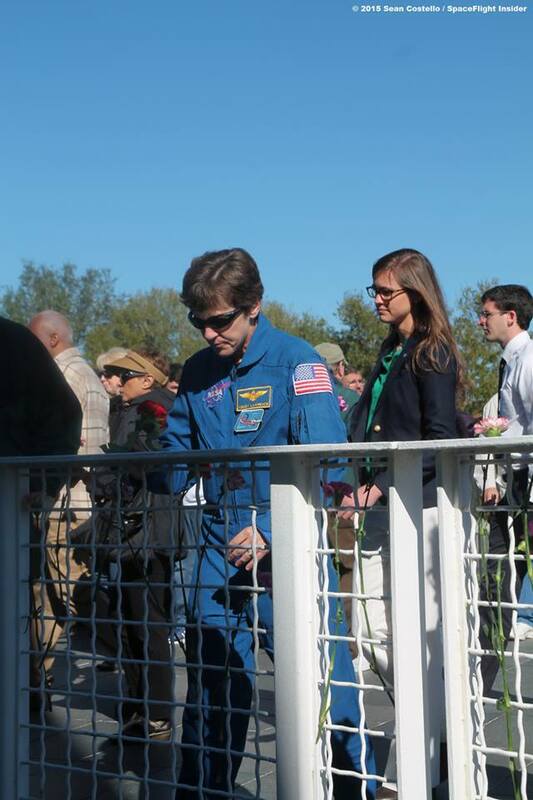 Among those leaving flowers were astronaut Wendy Lawrence, a veteran of four shuttle missions, including STS-114, the return to flight after the Columbia disaster. Also in attendance was Florida Senator Thad Altman. Long-time Launch Director (LD) Bob Sieck was also in attendance. He talked about his 1963-1999 tenure, and that incidents like this – were a sad part of the business. He noted that Challenger’s crew were aware of the risks. Over 50 students from Ilan Roman High School in Beersheba, Israel were in attendance. This is the twelfth year that the school, named after Columbia STS-107 astronaut Ilan Roman, has sent a contingent for the ceremony. Many other present and former NASA employees were in attendance. Unlike the previous night’s memorial for Apollo 1, the attendees who worked on the 1986 and 2003 launches continue to attend these events. 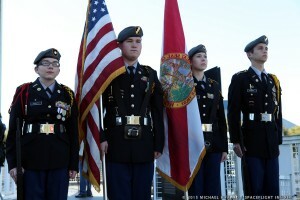 The colors were presented by a color guard from the Junior ROTC program from Merritt Island High School. Susie Cunningham sang the national anthem. 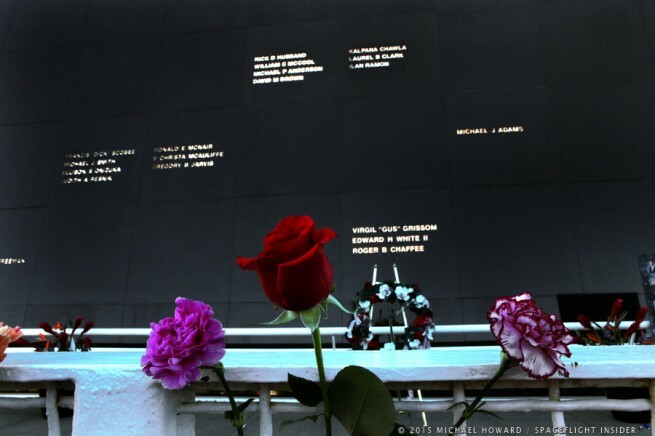 A large wreath with the words “Fallen Heroes” was placed at the memorial by Kennedy Deputy Director Janet Petro, Kennedy’s Associate Director Kelvin Manning, and President and Chief Executive Officer of The Astronauts Memorial Foundation, Senator Altman. Janet Petro thanked the crowd for attending today’s Day of Reflection. She noted that a similar wreath was being presented at Arlington National Cemetery today by NASA Administrator Charles Bolden. The colors were retired and the ceremony concluded at 10:36 a.m. EST (1336 GMT). Many people in the audience have a personal story to tell about their connection to one of the missions. One notable story was that of Canadian Mark Gotch. Gotch recalls driving from Clearwater to West Palm Beach in 1986 when he took a detour on the 528 Beeline tollway to watch Challenger launch. He detailed how he got out of his car and snapped six photos using his film camera. Months later, after returning to Canada and processing the film, he sent enlargements of the photos in to the team investigating the Challenger disaster. He eventually received a typewritten thank you letter from Charles J. Stevenson who was the head of the investigative team examining all photos from the launch. Stevenson said that one of Gotch’s photos was a key to understanding how the crew cabin separated from the shuttle. 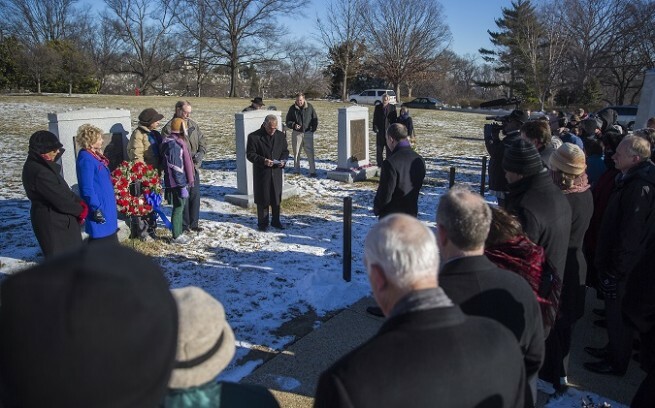 Today’s ceremony is only part of NASA’s National Day of Remembrance, as NASA administrator Charlie Bolden visited Arlington National Cemetery for a 90-minute wreath laying ceremony. 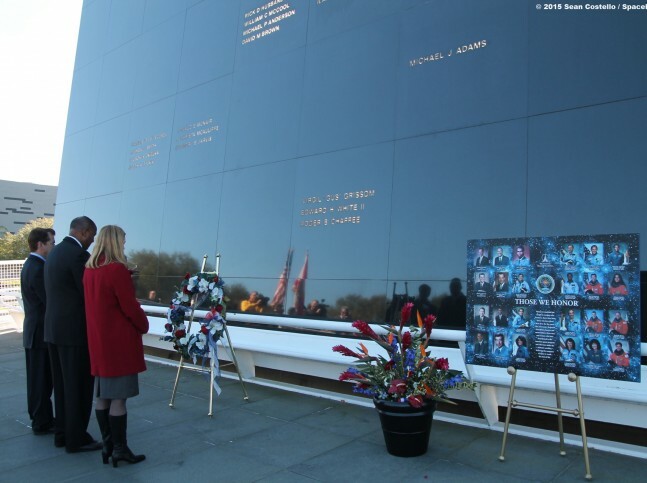 During this morning’s ceremony Bolden addressed NASA personnel and others, and wreaths were laid in memory of those men and women who lost their lives in the quest for space exploration. On Thursday, Jan. 29, at NASA’s Marshall Space Flight Center in Huntsville, Alabama, a candle lighting ceremony will be held led by center director Patrick Scheuermann along with former shuttle astronaut astronaut Robert “Hoot” Gibson at 9 a.m. CST (1330 GMT).